I think about everything, I’m afraid. Oh, my dear! This is finishing it’s third season, and just a few weeks ago announced a fourth! This is positively ancient by nightly drama standards, isn’t it? Thankfully, TV drama tends to develop with age, and believe me, that is doubly, triply, quadruply thankful in the case of Grimm. I am a critic by nature, darling; I can never be a fan of anything. Such is my blessing and my curse. And even though this is the internet, let’s be honest, shall we? There were some serious problems with the first season. But, hey, even the trappings of a horrible outfit can look good on the runway with a brilliant model– it’s all about the people inside, n’est ce pas? Character counts? And, yes, I think we can all agree that our hero Nick, David Giuntoli, is a brilliant model of manhood. Did you know he was considered for Man of Steel? Indeed. But as good as poor, adorable Giuntoli is, it’s really Nick who I’m disappointed in. Can you honestly tell me why Nick is a hero? What’s his motivation? 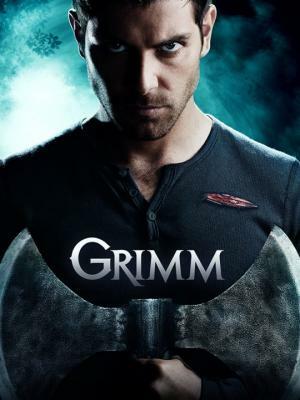 I can understand if, in the first season, he may be acting out his role as a “Grimm” simply because he has been flung into a brave new world by his dying Aunt, and he must find a way to survive. But what has happened instead is that Nick is merely fulfilling his role as Grimm at night the same way he fulfils his role as police officer by day– he’s basically punching a card and following the job description someone gave him. Having a sense of duty is nice, isn’t it? But WHY should someone have a sense of duty? It’s not all about duty, because he tries to balance it with a “normal” life with his family, by which I mean of course basically just one person, Juliette. So it was a great decision to name the show Grimm, as it was really all the Great Nick Show in those first seasons, really. His job partner, his life partner, his were-partner, everyone really was there just so Nick could move through the plot. So here’s the “thankfully” part– the show runners have finally realised that it’s better for Nick to have all such partners be fully aware of his nature as a Grimm. There’s actually a supporting cast that can interact more freely! Hooray! Especially for Juliette. In the beginning, she’s a perfect example of a problem character for characters with a secret identity. She’s someone who has to exist to support Her Man, but by definition she never can, because she can never know him fully. Passivity is so passé. Shush! Shush! Shhhhhhh! There are some things we never speak of, my dear. And look, she is still Ms. Problem! What can she really do, I mean, REALLY? She is a veterinarian, so that is somewhat, kind of, tangentially, if-you-squint related to the Wesen creatures Nick encounters? She is good at using Google? She can also read from the Big Book That Knows Everything? If you are starting to think that this show is not necessarily meant for a female audience, I’m starting to think you are right. There really are no female leads, only support– Juliette and Rosalie– both defined only by their support of Nick. Oh? You will argue about Rosalie’s relationship with Monroe? Still defining by relationship and support of a man, dearie. Notice the other women who appear? All villains or creatures of the night who must be destroyed. And yes, I am raising my eyebrows in a knowing way right now. I was going to subtitle it this way– Grimm: Nick and his Walking Talking Resources. But you are right to some extent. Must be those sharp, twinkling blue eyes of yours! There is a lot of world-building going on here. Too bad it’s so schizophrenic! The writers here seem to want to wrap a chiffon around the dungarees. But that’s just too separate to mesh well! Yes, it’s a wonderful world of drawn-out B Plots and wedding plans. But let’s leave with something good to say, yes? I’m such a positive person by nature, you know. Let’s see… Whoever Nick and Juliette hire to do their innumerable home repairs will certainly be able to afford a nice university for his children. 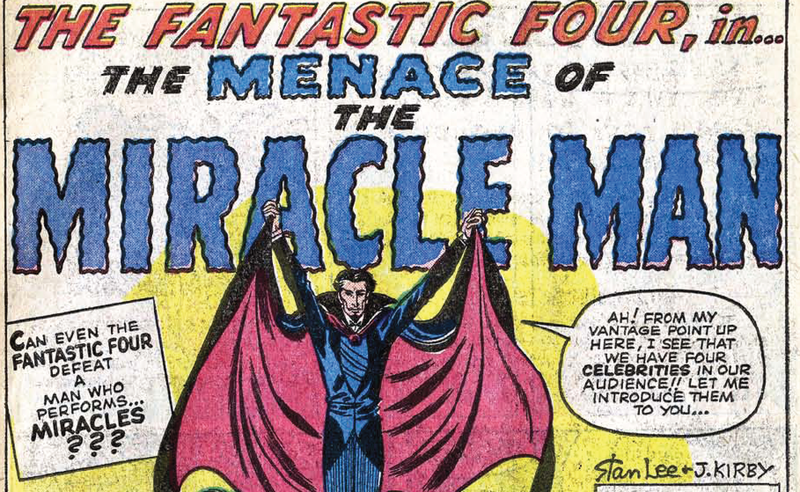 In which Vera Maven tries to find something new to say about a comic 50 years old. Vera! So nice to see you again! Likewise, Darling. Like and wise. Two words for you: Fantastic Four. Ooh! Three more for you: Fan. TAS. Tic! I hear you can critique this comic book property and have noticed something that *everyone* has failed to see. Does this mean you actually like them? Well, I like the *idea* of them. What a wonderful property, you know. “In one corner, someone invents a wonderful machine that goes horribly wrong, while in the other corner, two others prank themselves over sandwiches, and in-between the insanity, someone has to keep the peace… BOOM! Instant adventures! Just add exotic lands, miraculous science, strange aliens, et cetera et cetera. Most people point out how ground-breaking this comic book was– how it has a legacy of literally re-inventing a genre and launching the Marvel comics’ “universe.” But what more can be done with them? Okay, okay. 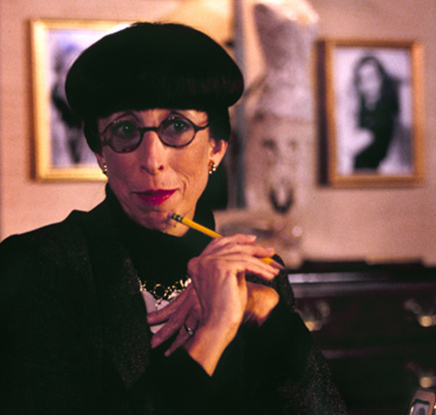 Don’t critique the critique, dear. What I MEAN is, one can’t just point to a wacky invention in a comic panel that turns into a portal for a new world and cry “exploration!” That’s just a plot set-up! Just *doing* exploration isn’t *enough,* in and of itself. In the same way, one can’t yell out “family!” and wave a page of plot around and expect a story to resonate with readers. This label of “family” isn’t a theme so much as it is a topic. So DON’T just have Mr F and the I-Woman kiss and hug to say the comic is all about “Family.” How about instead have plots and characters coming together and falling apart and intertwining with all KINDS of stuff in order to say something LARGER– like “family can be made of different kinds of people” or “family unity helps us overcome our challenges.” It’s a subtle difference, but one necessary to tell a good intellectual property from the bad. And you are all about subtlety, aren’t you, Vera? Don’t insinuate, dear boy. It’s unbecoming. So… what are left with, then? A family who explores things? I thought you said you had something new to offer? Not new, per se. To my pretty little eye everyone seems to be forgetting one very important detail. Think back. After all, even YOU have noticed the “legacy,” n’êtes-vous pas? What is the one feature of the team’s stories BESIDES family or exploration, something that was part and parcel of the book from the beginning? 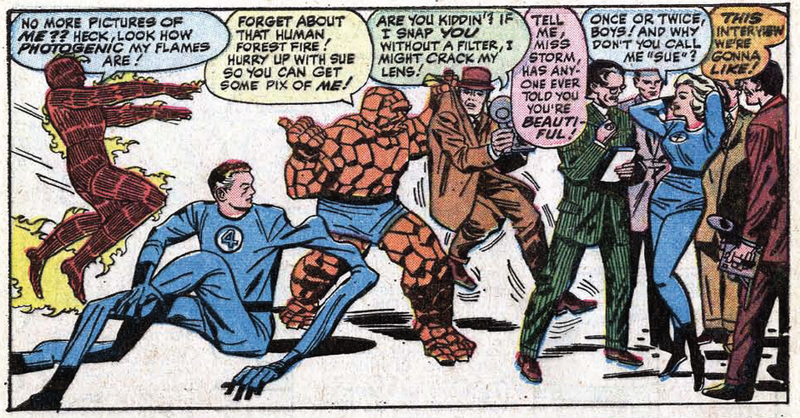 It seems we have all forgotten one of the Fantastic Four’s key themes is… Celebrity. 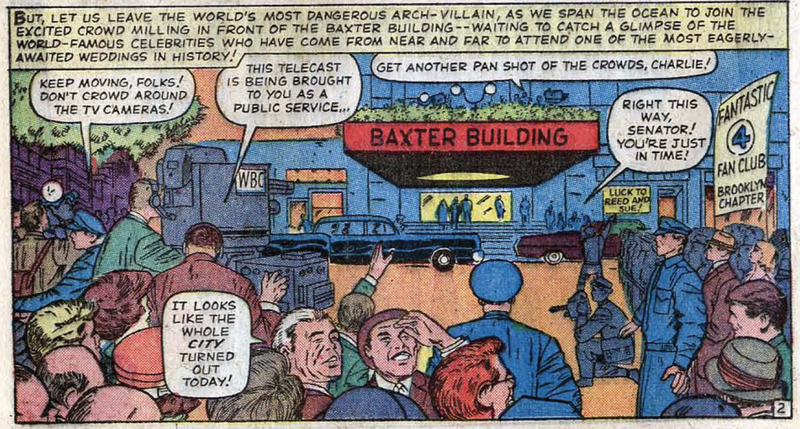 It also features the the first appearance of their very own skyscraper and flying car. By Issue Six, the characters spend a whole page or so to answering fan mail, thereafter a recurring element, and by Issue Seven, they’re even invited to Congressional dinners! And can you guess? Their celebrity status grew and grew. And the characters kind of liked it. Perhaps it’s a SUBTLE thing, because it doesn’t drive the plots as much as the family or invention/exploration thingees, but there is a drive or a force of tone because of the celebrity element that’s in the background. These aren’t just the efforts of some work-a-day hero or even a hard-luck hero, whose efforts are noble but ultimately under the radar, but these are top-of-their-game, larger-than-life archetypical heroes with the whole world watching! So then, notice– there are two extremes at work here. One: a familiar family with quibbles and foibles like any family’s. And two: celebrities with fan mail, a lofty skyscraper house, and friends of kings and queens and alien Watchers. This seems to be an important element to distinguish the Fantastic Four, but where is it lately? I sigh. Sigh! The stories (and they are some GREAT stories of course) take place entirely in the lofty, other-wordly skyscrapery castle for these larger-than-life figures. Contrast this to another famous super hero property all about “family” — The Incredibles. Their setting? The house next door. Where the bubble gum kid is wowed every day by the, well, incredible people around him. Occasionally, we’d see some citizens in New York reacting in a very bubble-gum-kid kind of way in those early FF issues, but I’d have a hard time remembering a similar scene in today’s pages. 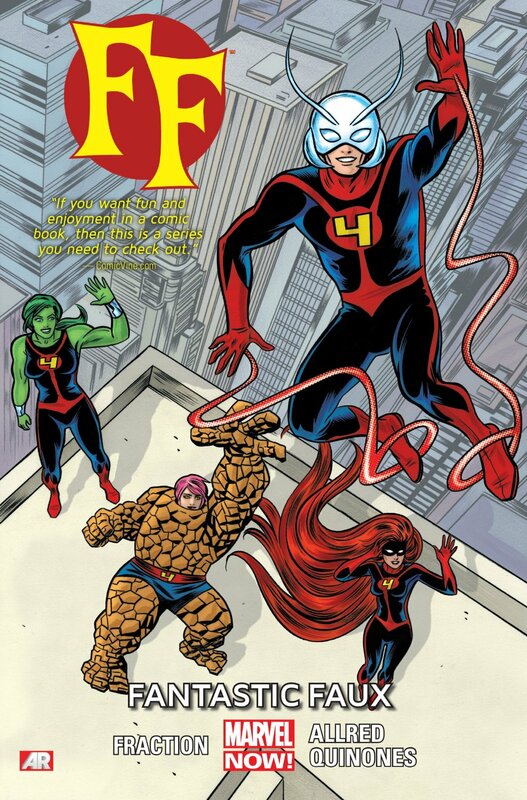 Here, an alternative Fantastic Four take up the roles of our original foursome, and while the emphasis is on the “extended family” of a school of gifted youngsters, there’s a nice undercurrent of public spectacle running throughout. It’s been a while since we had an Avengers Day parade, even. Perhaps that’s the thing– the celebrity angle has been co-opted by a certain Iron Man. Certainly his movies have allowed him a degree of celebrity that the Fantastic Four’s cinematic offerings have yet to rival. For that reason Tony Stark is the Marvel Universe’s go-to guy for hi-tech hijinks. He’s the Marvel’s Apple products to Mr. Fantastic’s Sony. Ah! Claps all around, I say, but only small little golf claps, five in total. 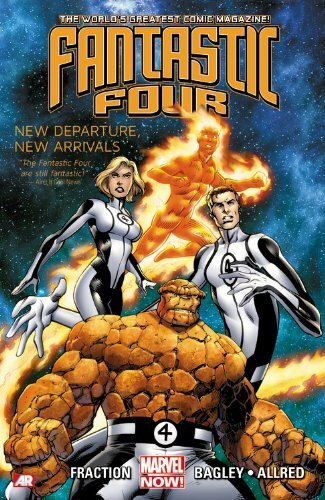 As a core concept, the Fantastic Four is a brilliant property ripe for adventures as well as comedy and complex interaction. They are primed for imagination and exploration. But as vibrant as the colors are, the truth is only the same picture is being painted over and over, and a key ingredient of being “celebrity” is too often overlooked, failing to give context to the remaining elements. Until we can get more momentum and change of status quo, and more commentary on the nature of celebrity in a heroic age, I can only give them three out of five flying bathtubs. That’s still better than one! And more than I will ever have, I’m afraid. Darling, I am wonderful as you well know. All my imperfections are exactly in the right place. Oh, that’s special. But you are fibbing, surely? Ah, but of course! Notice how you’ve captured something realllly interesting, here. One really must distinguish the use and purpose of Captain America BY HIMSELF and Captain America as a team member. I can see it in that strong chin of yours, my dear. You never liked Captain America when you were younger. You liked the teams, mostly. I mean, of course, sure, you liked the Spider-Man, maybe even a Batman here or there. But there was something about the Captain by himself that just didn’t SPEAK to you, n’est ce pas? For you, Captain America, as a solo hero, could never just BE a hero fighting for himself– because he always represented something LARGER. You thought he MUST be fighting always because of something else, yes? Look at him! Dressed with patriotic colors, holding a powerful round shield, often seen in the company of flags, stars, and stripes? How could he NOT be a soldier for some “agenda” of The Man? A super-soldier, of course, but a soldier nonetheless. Whereas the BEST heroes were vigilantes, outliers, the MAVericks. By definition, OUTside the system. Ah! But you were young and so beautifully superficial! Just looking at surface details. 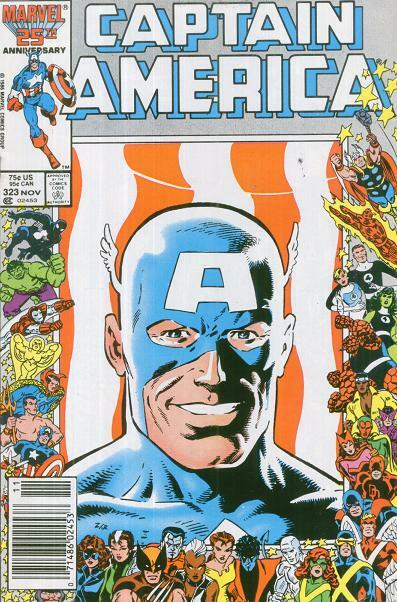 You see, what really makes Captain America work as a hero is NOT any kind of red-white-and-blue conformity. That turns out to be irrelevant! No, his story is all about one theme– STRIVE FORWARD. 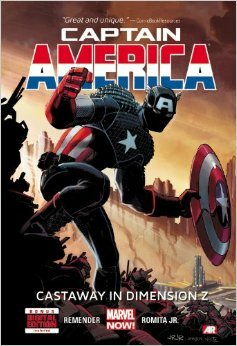 Now, obviously, this theme absoLUTEly thrives in context of a super-soldier– just throw in some World War II, or even some classical “American Dream” mythos in general. BOOM! INstant story– but one in danger of not just being a metaphor but an allegory that is so punch-Hitler-in-the-face that the READER sees stars and stripes. No wonder young little fanboys like yourself think that’s all there really is to Captain America! Let’s not be so hasty, dear. There are some clear problems, here, OB-viously. What good is this theme without a steady way to highlight it? 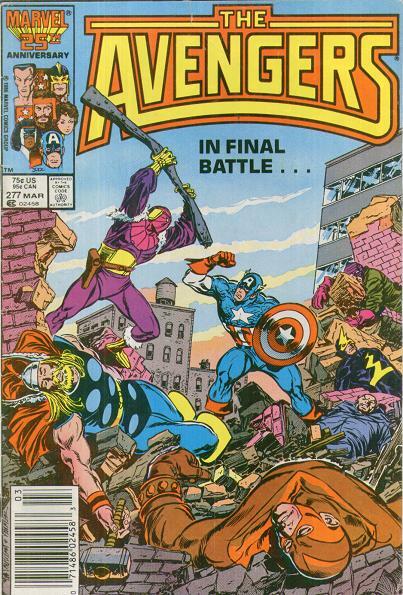 Cap has no *regularly*-featured supporting cast. Sure, you may have Falcon or some S.H.I.E.L.D. agents here or there, but there is no ensemble cast for him to be compared/contrasted against or to offer some plot springboards, et cetera et cetera. No wonder this central theme is lost! For Batman, Superman, Spider-Man, Fantastic Four, even Hulk (well, SOMEtimes) have what we call whole *franchises* surrounding them. The good Cap has a few of these, in a pinch, but is nowhere near the same level. Is there no wonder that he has a hard time resonating with readers *as a property,* when all the trappings of a property are either superficial or essentially non-existent? Would Superman be as iconic as a property without having the same amount of shared history with Lois Lane, the Daily Planet, Jimmy Olsen, Supergirl, et cetera et cetera? Instead, with Cap, one has a hero that works best in an ensemble but is never given time to actually DEVELOP with a supporting cast? Oh, and please tell me you consider villains every time you’re considering heroes, yes? I mean, REALLY iconic heroes have also villains that can *specifically* highlight their themes, too. And where’s Captain America’s? Ah, ah, ah! I know! You are about to say “Red Skull,” aren’t you? Yes, yes, yes, a FABulous villain, yes. But really THINK. Is the Skull as a villain REALLY able to show what Captain America is all about? The Skull’s just, well, EVIL. Where’s the nuance? Where’s the thematic resonance? There’s no contrast in the same way Spider-Man/Dr. Octopus play off one another, to say nothing of Batman/Joker. (In fact, I’d say a kind of “Joker” is what Cap really needs. He *should* be paired with a villain who’s theme is all about selfish play. So bring back Madcap, Jester, Screwball, or even, heaven’s forfend, Deadpool!) Try pairing him also against villains like Flagsmasher, Nekra, Black Mamba, or maybe crime cartels like Count Nefarius or Madame Masque. One “classic” villain used well in this regard recently was Arnim Zola under Rick Remender’s pen (Captain America #1, Nov. 2012 – Captain America #10, July 2013; collected in Captain America: Castaway in Dimension Z Book 1 and Book 2) As a bonus, Cap was given a sidekick, first his “son” and then Zola’s “daughter” Jet Black. Could it be that the good Captain has a chance to really show his STRIVE FORWARD theme for the first time in ages? Oh, such a classic hero, with dramatic imagery? He’s near the top of the scale, surely, but points have to be taken for such dangerously superficial trappings and a lack of driving story devices. 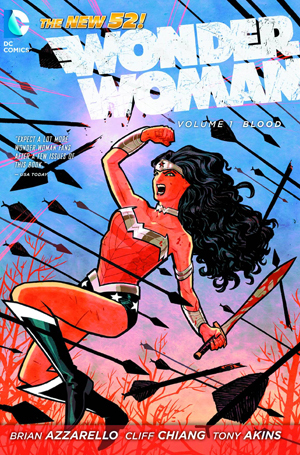 Also, the current portrayal in the comics is just so leathery-strappy, like they are forced to draw some hyper-realistic version from the movies instead of a clean line of comic booky graphic design. So I’m thinking… a 7. Solidly.